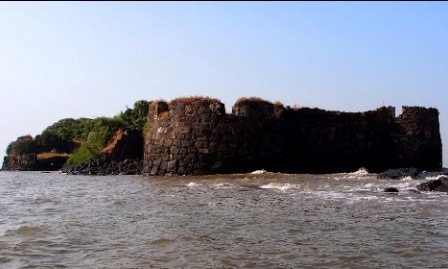 Khanderi Fort is on the small island, 3-4 km in the sea from Thal beach. It was built by Maratha ruler in 1678.There is a Lord Vitthal temple and a Tomb of Daud Pir inside the fort. British rulers built 75 ft tall light house in 1867. 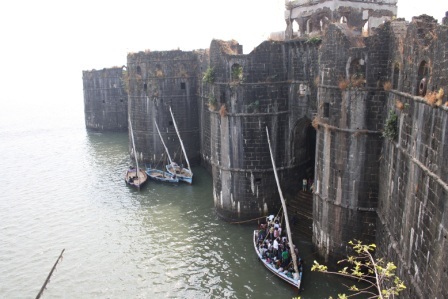 Visitors can reach the fort by hiring local boats with the permission of Mumbai Port Trust. Undheri fort ia located at a distance of 300 meters from Khanderi fort. It was built by Siddi Qasam in 1680. The fort changed hands from the Siddis, Peshwas, Angres and the British. 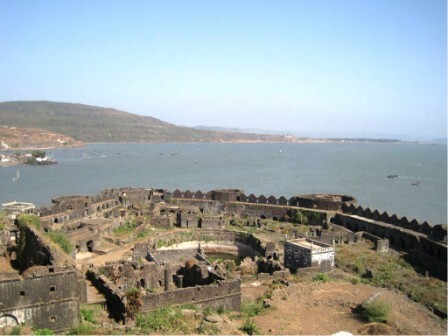 The visitors can hire local fishing boats from Thal to visit the fort after seeking permission from Mumbai Port Trust..
Janjira Fort is also a sea fort located near Rajapur which is south of Murud. The fort is 40 ft high and was built in 15th century AD under the rule of Emperor Malik Amber, who was the ruler of Ahmednagar. The fort consists of several towers and turrets, which were used for keeping guns. At the main entrance of the fort, a beautiful stone carving, depicting a tiger trapped by six elephants, is present. Thre is a sweet water lake inside the fort. Sagargad is a hill fort situated at about 7 km from Alibaug. It a at a height of 1,357 ft above the sea level. 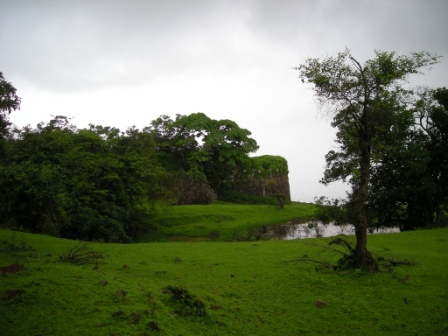 The fort can be reached by taking a dirt-track road, which begins from Khandala on Alibaug road. The main entrance of the fort and the two bastions are completely damaged. The fort also has a temple and a tank named Pandav Kund. There are nine tombs of Satis hence is called Sati Plateau. At the end of this plateau, there is a thumb shaped hillock called Wanar tok. 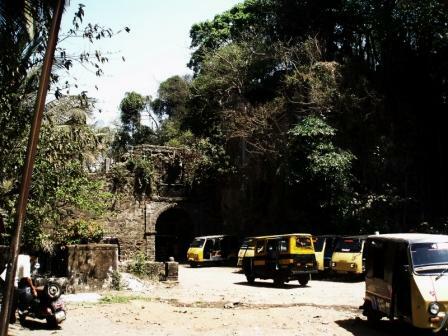 Revdanda Fort is located around 20 km from Alibaug and is also known as Revdanda Aagarkot. The fort was built by a Portuguese Captain, Soj in 1558. From the fort, tourists can view the Revdanda Port. Fort has seven-storey tower covered with betel nut plantations. The Kanakeshwar Devasthan Temple is 13 km from Alibag near Chondi. This is a very famous Shiva temple. The temple is on a 900 feet high hill. To get to the temple one has to climb a flight of 5000 well paved stairs. This temple premises comprises of other temples dedicated to Sri Balram Krishna, Sri Hanuman The Shiva temple is the main temple. The height of the Lord is 54 ft. Behind the temple is the Pushkarna Kund., a prominent attraction among tourists. Rameshwar Mandir is a temple located in Chaul, Maharashtra, India. It is a very ancient temple of Lord Shiva. The Chaul region is known for its temples. There are 365 temples in Chaul, equal to the number of days in a year. The date of construction is not known, but the temple has been renovated several times. In the front there is a large pond known as pokharan in Marathi. The Mandir has three tanks (called kund in Marathi): parjanya kund, agni kund, and wayu kund, representing three elements of nature—Rain, fire, and air. 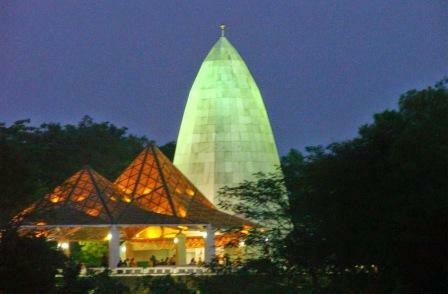 Vikram Vinayak Mandir (Birla Mandir) is situated inside the Vikram Ispat premises, which is at a distance of around 20 km from Alibaug near Revdanda. It is surrounded by beautiful garden and fountains. Located on a small hillock, the temple can be reached by climbing the well paved stairs. Datta Mandir is located in the chaul part of Revdanda. The mandir is on top of the peak, the road leading to the mandir is of almost 1500 steep stairs. From this temple we can see entire region around revdanda. And it is believed that it was built in Raje Shivaji's reign to keep an eye on enemy. There is huge celebration for five days in a year, it starts on birthday of lord Datta and continues for 5 days. Siddhi Vinayaka temple is situated near secluded Nandgaon beach between Kashid and Murud about 10 kms before Murud. A grand festival is organized here every year on 'Maghi Chaturthi' day. Another traditionally auspicious day for 'Darshan' is 'sankashti chaturthi' or 'Sankata Hara Chaturthi' every month. 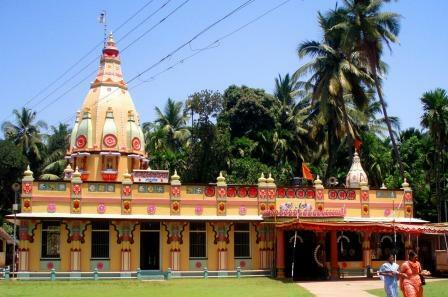 Nagoba Mandir is 16 km from Alibaug and is situated in vicinity of Saswane Beach. The main idol present in the temple is of a hooded snake. In the temple, there are several bells hanging in groups that form the major attraction. According to the legend, a man was bitten by the snake and was cured of it magically when he came to this temple. Thus, the temple became popular among those suffering by a snake bite. This temple also has the samadhi of a saint and it is believed he had divine powers. 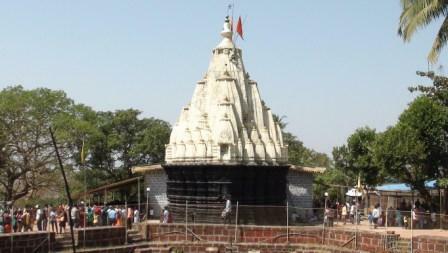 Someshwar Temple is an ancient Hindu temple in Akshi, which is situated at a distance of 3 km from Alibaug. It was built by Satavahana rulers and the structure reflects the architectural style of their ruling period. Kanhoji Angre was a notable Navy Chief of the Maratha Navy in the 18th century. He fought against the British, Dutch and Portugese. Despite the attempts of all these foreign powers he remained undefeated until his death. 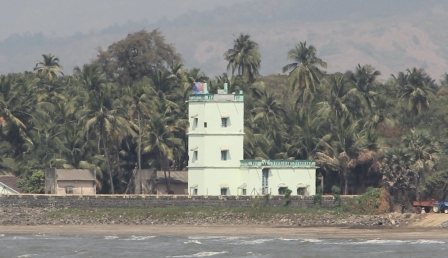 Sardar Kanhoji Angre created an operating base from the fortified islands of "Kolaba" at Alibaug. Khanderi and Underi off the coast of Thal, Alibaug. He established a township called Alibag. ​Kanhoji Angre Samadhi is a beautiful tourist spot in Alibaug that was built in memory of the great Maratha Admiral Kanhoji Angre. The samadhi has eight faces and the sculptured pillars, which have been dilapidated, however stand firm. 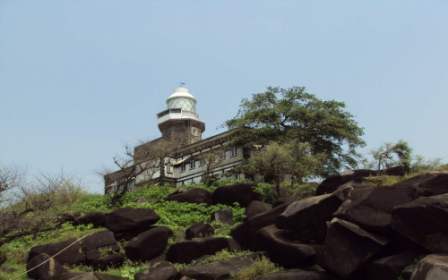 Magnetic Observatory was established in 1904 in Alibaug, which serves as one of the significant observatories to form a global network. It is located on the beach along the J.S.M. 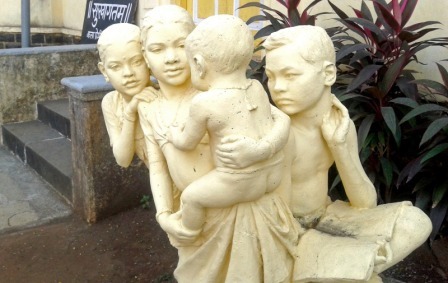 College of Alibaug. The observatory provides record for the geomagnetic observations. The observatory is constructed in British style of architecture using Porbandar sandstone. The observatory has two buildings; the first building has magnetometers that record changes occurring in the Geo magnetic fields. The second building consists of precision recording instruments, which give data about geo magnetic storms caused by solar storms. ﻿Karmarkar Shilpalaya, Saswane:﻿ Mr. Vinayak. P. Karmarkar, born on 2nd October 1891, was among the most renowned sculptures of all times. 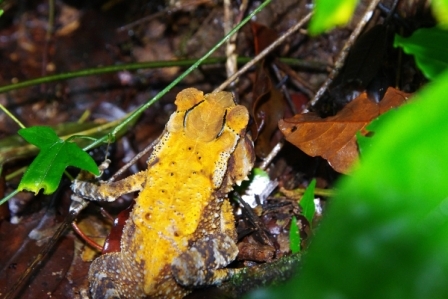 Topper of J. J. School of arts, winner of Lord Meyo Medal and also alumni of Royal Academy; Karmarkar’s sculptures are a pleasure to see. There are approximately 200 of them in this museum with Hira Kolin and Shankhdhwani being the most noted ones. Make it point to spend an hour or two here. Bramha Kund is which is situated on the top of the hill and is 20 km from Alibaug. There are two popular kunds at this place, the Shiva pool and the Bramha pond. 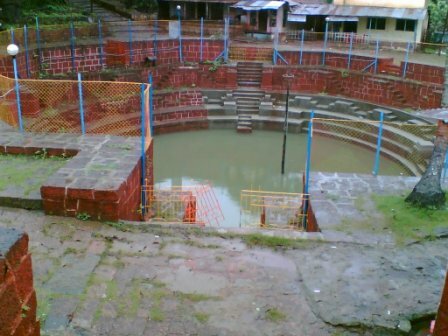 Bramha Kund is a rectangular shape tank, surrounded by steps from all the four sides. It is believed that the kund was constructed in 1612. There is also a small Maruti mandir and a statue of Mirchi Baba. Vrindavan Farm is spread over an area of 28 acres near Kanakeshwar. More than 70,000 varieties of plants such as cacti, mango trees, crotons, guava and custard apple are found in huge number in this farm. This farm also has art and craft museum where small wings can be seen. Several tribal produces, bidri ware and patta chitras are displayed in the museum. 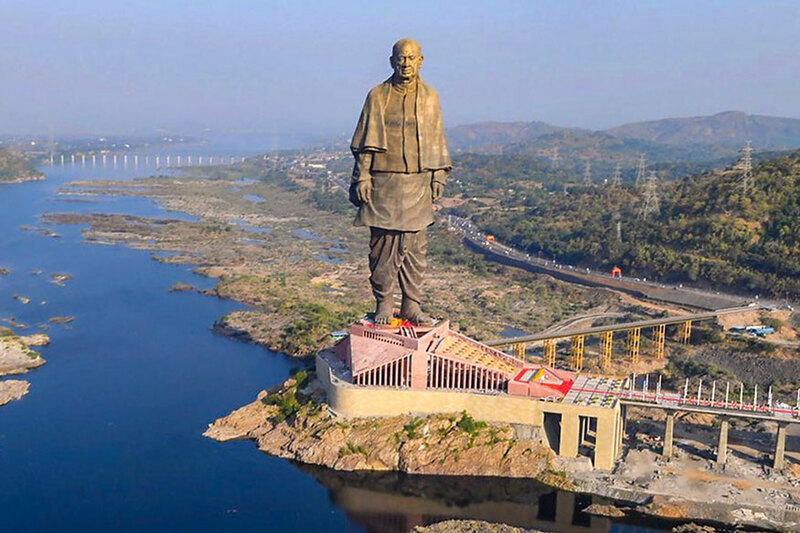 To attract tourists, the Gujarat tourism department has opened online booking for not just entry to the statue site but also for tourism packages, including accommodation inside tent houses. Located just 10 minute drive away from the Statue of Unity, a luxurious nature retreat along Panchmuli lake, Tent City Narmada, has been thrown open to tourists.